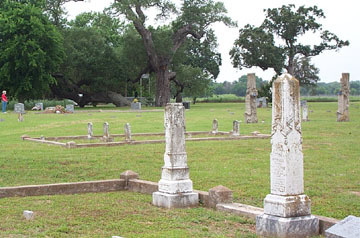 The entire plot is 4 acres, the burials are all to the right of the granite entrance marker. Mr. T.H. Johnson did a complete survey of this site in 1975 and it is on file in the archives. 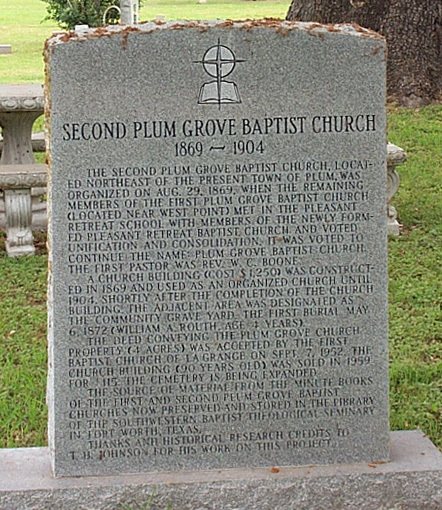 Johnson's report states: The Second Plum Grove Baptist Church came into existence in 1869, when the members of the old (First) Plum Grove Baptist Church (near West Point, TX) united with a newly formed Baptist Church of Christ at Pleasant Retreat. 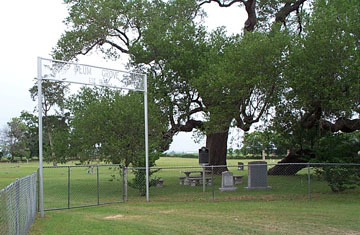 The site chosen for the new church was approx. 3/4 mile NE of the town of Plum. Construction of the church house was completed in early 1870. By 1900 the membership had declined and the church disbanded. 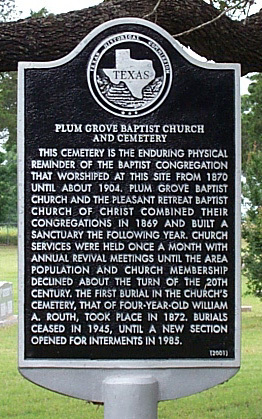 Paul Smith contributed the following data from his survey of the Plum Grove Cemetery. Co. I 27th Tenn Inf. CSA.